Susan Braverman, President of The Flag Shop, was bullied in grade 8 and will never forget the trauma of having to change schools to escape the torment. She was one of the lucky ones who had the support of her family to help her through a devastating period, but not everyone does. Ever since then, Susan has been conscientious of what bullying can do to people. In early 2014, The Flag Shop was asked to produce a flag based on the winning design for a Pink Shirt Day competition submitted by Grace Fenton, a Grade 7 student from New Brunswick. 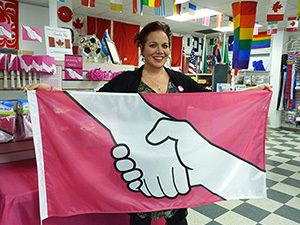 Susan immediately knew that she had found the perfect design to represent The Flag Shop’s Anti-Bullying Campaign, an initiative that all 12 shops across Canada were strongly committed to championing. All of The Flag Shop’s Anti-Bullying products are available online and at each of the 12 Flag Shop locations across Canada.